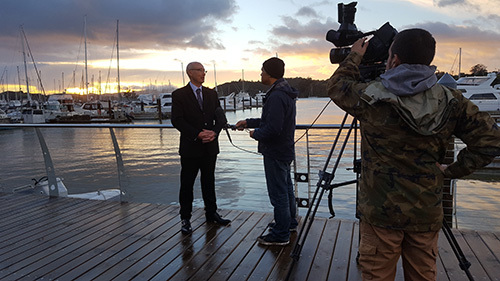 A dawn unveiling ceremony at Bay of Islands Marina in Opua today conferred the blessing of tangata whenua on 149 new marina berths and work which will start soon on the next phase of the marina’s expansion project. 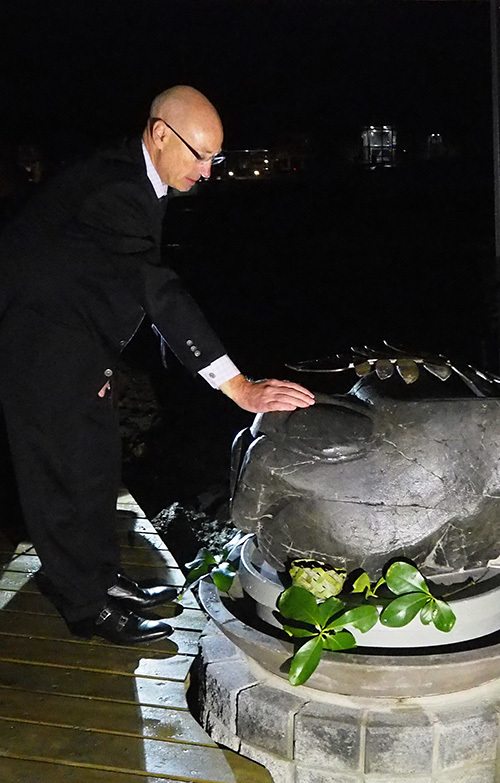 Four pou were unveiled, along with a commemorative anchor stone and a touchstone representing local hapū Ngāti Manu. 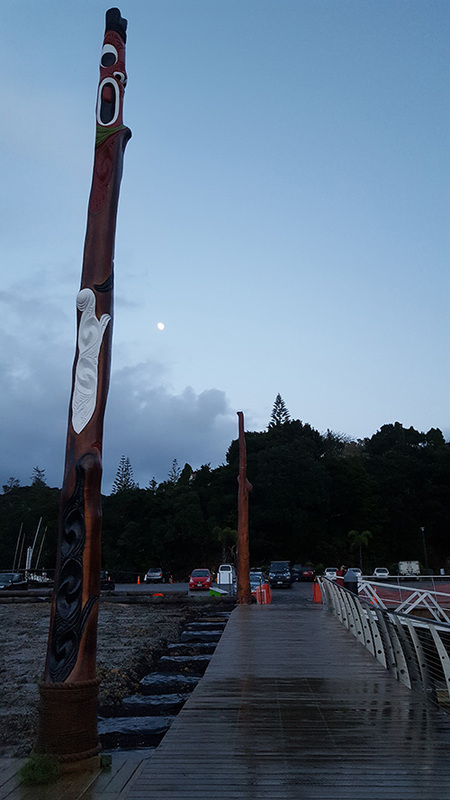 These will frame the entrance to the marina and acknowledge the richness of Māori history in the Opua basin, a feature thought to be unique among marinas in Aotearoa. The next stage of the project will see the construction of apartments, shops, offices and a landscaped recreational area specifically designed to benefit the wider Opua community. “The area has for decades had a rather sterile and industrial feel to it,” said Andy Nock, chief executive of Far North Holdings, which owns the marina. “We have successfully completed the reclamation stage of the project and work will now start on turning this place into one of the main centres for our community. That’s good for everyone; the people who live and work here, the people who want to berth here, and the businesses who’ve set themselves up here. Mr Nock said Far North Holdings was taking tangata whenua with it on this journey out of respect for the heritage of whānau, hapū and iwi. 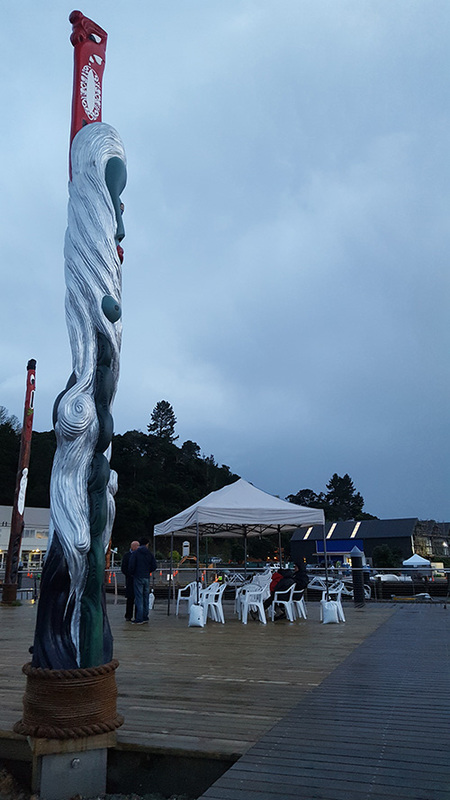 Arapeta Hamilton, speaking for Ngāti Manu, said it was appropriate that the marina extension featured the story of his people. He said Opua had been about boats and trading since his entrepreneurial ancestor Pomare II lived at Otuihu in the 1800s. He said, too, that local Maori wanted a cleaner Taumarere River and a good relationship with developers was important in achieving that. 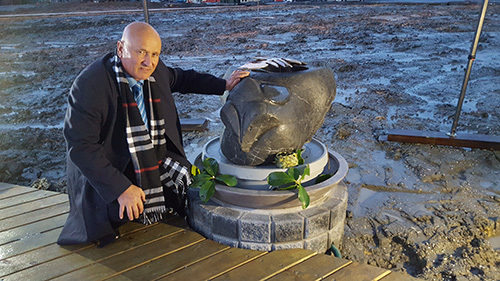 The pou have been installed at Ngāti Manu’s suggestion and were commissioned from local craftsmen by Far North Holdings. Each pou has been rendered by a senior Māori carver. 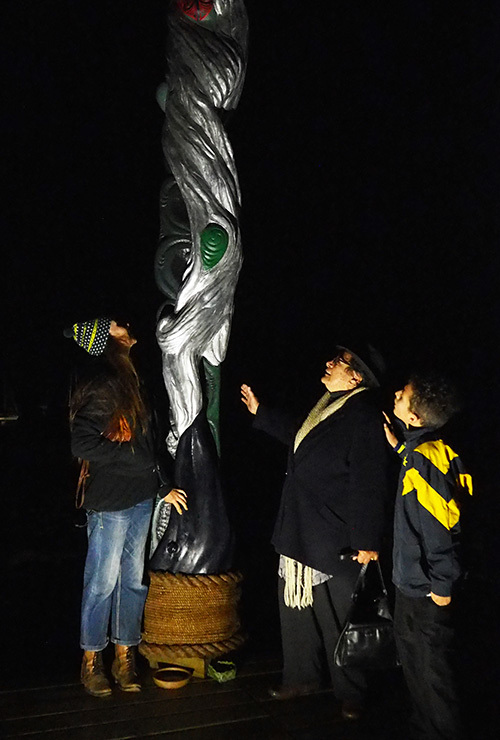 One features Rongo-marae-roa, the god of Peace, offering a kumara plant as a peace symbol. Another depicts Hinemoa, the goddess of ocean currents, waves, seafood and fish. Yet another represents Hinemoana Tawhirimatea, the god of wind. He is represented by a spiralling column of air reaching for the eye of a storm. A fourth speaks of Tangaroa, the god of sea creatures. He is in the form of a whale, an animal held in awe by Māori. 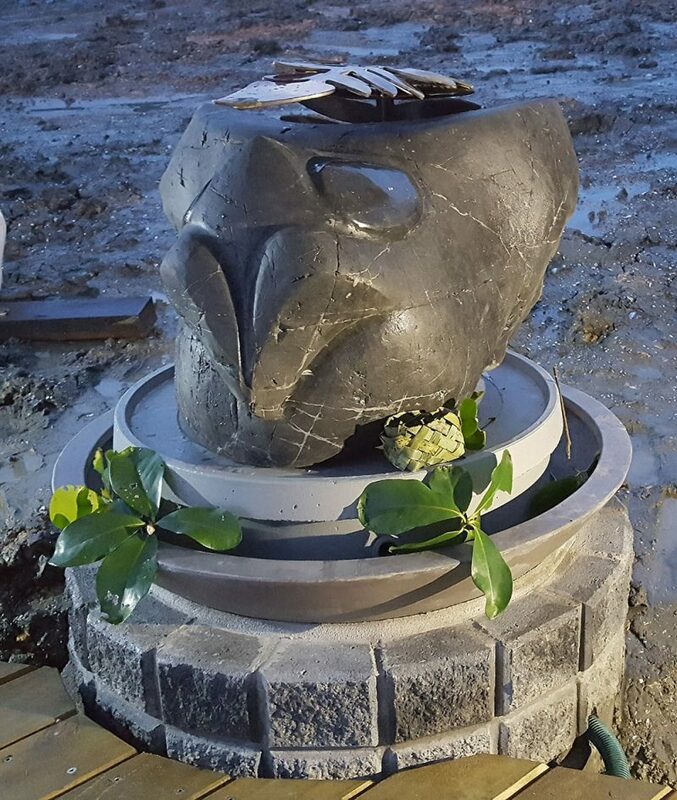 The touchstone, Ko Te Kohatu Manea o Ngāti Manu, was taken from a nearby quarry and is shaped like a bird’s head. People are encouraged to touch it, whereupon a person’s negative energy is said to dissipate. The wider financial benefit to the region of the marina’s expansion is estimated to be in the order of $23 million a year from the fifth year of full operation, through longer stays, a greater number of visitors and the associated repair and maintenance work that will flow into the burgeoning Opua marine services hub. Opua Business Association says businesses in the town could enjoy a 44 percent growth in turnover and that about 60 new jobs could be created. Work on the water is almost complete. 149 new berths have been built, bringing the total on offer to 400. They and the piers, which have been named after local fish species, have been built to a high standard. Many little details speak to the influence that Ngāti Manu has had. The waterfront recreational area is due to open to the public by the end of the year, along with an improved, fully-sealed parking area adjacent to the public boat ramp and the apartment and retail building currently under construction. It will feature lawns, native plants, a boardwalk and a landscaped area with seating, barbeques, a performance and entertainment stage and a play zone for children. The final stage of construction will see the development of another apartment and commercial building on the reclaimed area. No dates have yet been set for this work.